Benny and Bat Sheva Shoham were driving home to Shilo from paying a condolence call in Raanana on June 4th , when their car was attacked by Palestinian terrorists. They had been driving east to the Tapuach junction, then turned south for the last 10 minutes of the drive home. In the back seat was their five month old son Yehuda, a child that had waited three long years to bring into the world. As they passed the village of Luban a-Sharkiya, Arabs suddenly appeared from behind a building close to the road, and hurled stones at the car. From almost zero distannce, one managed to hit the front windshield with a ten-pound stone. The stone passed between husband and wife, hit the back seat, and rebounded with enough force to destroy the base of the brain of Yehuda, asleep in his child seat, facing backwards. Yehuda entered the intensive care unit in Hadassah hospital in very critical condition. Physicians reported that the infant sustained serious injuries to his brain as a result of the trauma to his head sustained in the attack. He was unconscious and connected to a respirator. For a week doctors struggled to save his life, but his brain had ceased functioning, and Monday June 11th he passed away. Yehuda Shoham never regained consciousness after being struck. He died of his serious head injuries in the intensive care unit of Jerusalem's Hadassah Hospital. 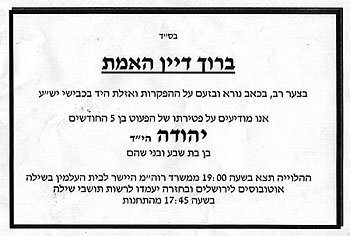 The funeral procession left from Jerusalem, opposite the Prime Minister's Office at 7:00pm, and proceed to the Shomron community of Shilo for burial in the Shilo Cemetery on Monday night. Benny Shoham, called upon Prime Minister Ariel Sharon to take part in the funeral. Prime Minister Sharon came to speak at the funeral procession outside his office. Despite Benny Shoham's pleas for restraint, and his exhortations to the crowd to heed Sharon's words, Sharon was continually interrupted by people in the crowd, who called for vengeance and declared that Sharon is to blame for the current situation. He was briefly interrupted with shouts of "End the restraint policy!" There were loud calls for revenge as angered mourners decried the nonfeasance of the government even after a young life was snuffed out in one of what has become daily attacks. The last night before Yehuda's death, the Prime Minister said tehilim (psalms) next to his bed. On national TV, the father held the deceased baby in his carseat of last week's blood stains, the blanket in its blood stains and the talis which wrapped the 5 month old. Kaddish was recited as the mourners answered amen as did those watching from home on TV. Policemen on horses for crowd control, IDF soldiers nearby, secular TV reporters, all answered amen to the father's kaddish. The TV cameras were live with the father's shaking hands holding his baby in the bloodied car seat, the bloodied blanket, and the talis. At the funeral, Benny expressed his faith in God and the Jewish people and their leaders, to lead us through the current situation, to a place where Jews can again walk proudly and freely in their land. The funeral procession left Jerusalem with one last stop at the exit from Jerusalem to stand so that Yehuda , the 5month old, could say goodbye to Jerusalem one last time. Fron there, hundreds of cars and several busses drove north to Shilo. There another large group awaited them, and together thousands of people accompanied Yehuda and his family on their last walk together. Arik Sharon, Prime Minister of Israel, attended the funeral and said the following: "Dear Bat-Sheva and Benny and families, friends who have come here from all over the country. I am not here to make a speech. I have come to cry, to cry with you together. Yesterday, I stood by the bed of Chaim Yehuda and patted his hand. It was difficult for me to leave him; he is exactly the same age as my twin grandchildren. I saw you praying with devotion, and I also prayed in my heart together with you. "How can they murder a baby? How can they do this? Only the wild and unrestrained incitement of the Palestinian Authority, which stands behind and activates this terrorism, leads to these horrific acts. "The responsibility for the security of every child in Israel is upon my shoulders, and I feel its weight. I feel its weight, yet my shoulders have not become weak, because I know that we must not allow our spirit to fall. If we ask every day, 'How much longer? ', we will lose. But if we remain firm and grit our teeth, and continue even when the tears choke our throats, we will win. And we will win. We have stood up to difficult situations, and we have overcome our enemies, and we will do this again in the future. "But my heart is pained at the fact that little Yehuda will not be with us when we arrive, in Eretz Yisrael, at the 'menuchah v'hanachalah [the rest and the inheritance].' And we will get there. May his memory be a blessing." "Sharon blamed the Palestinian Authority and the ceaseless Palestinian incitement for Yehuda's death, and declared that while he was responsible for all the children of Israel, the burden lay heavily on his shoulders." "If we keep on asking, every day, 'How much longer?' then we will lose. But if we stand together and grit our teeth, even when tears choke our throats, we will succeed," he said. Turning to Benny, Sharon requested the couple's permission to visit them in Shilo during the shiva. Palestinian Authority officials claim that rock-throwing is "not violence." Prime Minister Ariel Sharon paid a condolence to Benny and Bat-Sheva Shoham on the last day of the shiva. Benny told the Prime Minister, "If public figures would make sure to begin every speech by saying that this is our Land and our State, this would strengthen the public, and it would also re-invigorate the leaders and restore their strength." Sharon agreed: "I have not an iota of doubt as to our total rights to Eretz Yisrael and Jerusalem. We may have erred in not emphasizing this more." The Prime Minister said that just as in the past, there were small groups who led the way, "the Yesha residents today are the model that should be imitated." 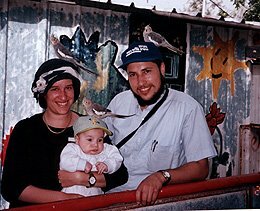 The family has decided on two projects to honor the memory of the youngest victim of the almost daily attacks on the children and citizens of Israel. For the mourning family this is a very urgent need and one of the ways that we can show our support. Please consider this worthwhile cause. On behalf of Lorye and the entire Harow, Salzman, Shoham family I thank you. For further information you can e-mail me at barry@imageworks.com We will keep you apprised on the fundraising efforts. You can send condolence letters to Benny and Bat-Sheva by email, or write them in the space below..
May we know the end of our sorrows soon. Another sleepless night. Sleep has not come easily over the last 8 months, but over the last week it has been non existent. 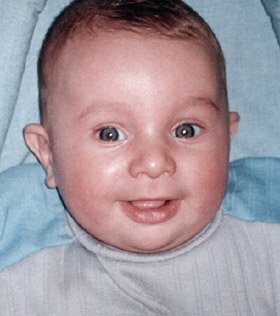 See, this week my 5 month old cousin, Yehuda Chaim Shoham h"yd, was murdered by Palestinian terrorists. Tossing and turning, I mourn my family's loss and Israel's loss, wondering when and if this nightmare will come to an end. Looking back though on the past few days, I gain strength from the most unlikely of sources, and this is what I would like to share with you. My wife and I were on vacation in the United States when we got the phone call. The phone call every Israeli family fears, prays will never come, but inevitably most get . Benny and Bat- Sheva were on there way home from paying a shiva call to Benny's parents, who were mourning the untimely death of Benny's 27 year old step brother in a car crash, when tragedy struck again. 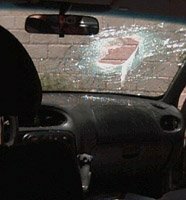 Just minutes away from their home in Shilo, a terrorist flung a boulder the size of a watermelon through the windshield of their car, hitting little Yehuda in the head. Upon arrival at the hospital it was clear that only a miracle would save Yehuda's life, as his skull had numerous fractures, and within hours it was established that his brain stem was destroyed as well. As I put down the phone, in a state of shock, I began to cry. Although we have all but become accustomed to dealing with heartache and continuous tragedy in Israel, this was different. This was my baby cousin, whose mother I had grown up with. Bat-Sheva was my cousin, my neighbor, my best friend. We spent a grueling few days in NY trying to get on the next flight back to Israel, finally getting out on Saturday night. Meanwhile, the doctors had declared Yehuda brain dead, and barring a miracle, it was just a matter of time. I prayed that I would make it back to Israel on time to say my goodbye to Yehuda, and be there to comfort Benny and Bat-Sheva. Upon arrival in Israel, we went straight to the hospital, it was 1:30am. Benny and Bat-Sheva had just put there heads down for the few minutes a night that they allowed themselves, so Yehuda's grandparents, my uncle and aunt, were bedside. My Uncle Jerry had just gotten off the phone when we walked in, and relayed his conversation to me. The phone rang in the ICU at that ungodly hour, and the nurse called my uncle over saying that someone was on the phone asking for a family member. The man on the phone, from Rishon Letzion, said right away that he was not a family acquaintance, nor had he ever met the family, but he could not sleep. He was heartbroken, and called the hospital to see how the baby was doing. He wanted the family to know that he was praying for them, and asked if it would be all right for him to come visit the next day. As I heard about this phone call, and the numerous others that had occurred over the past few days, I realized how Yehuda's condition was truly in the hearts of all Israel. We went home to catch a few hours of sleep before we would return to the hospital. On the drive back to the hospital we got a call, "It's only a matter of minutes, get here quickly". As we walked into the ICU it was clear that Yehuda had just passed away. I immediately broke down, as my sobs joined the chorus of screams and tears that filled the room. Looking at Benny and Bat-Sheva, I got my first glimpse of their true greatness, courage, and belief. As I stood over Yehuda, wailing, it was Benny who came over to comfort me. As he hugged me, he said that this was all from heaven, and that Hashem had his reasons. Walking around the room, it was Benny and Bat-Sheva who looked to comfort us all. That evening the funeral procession started at the Prime Minister's office. As Benny spoke, there was not a dry eye in the crowd of thousands. He spoke of how Yehuda's death had united the people of Israel, and had brought them together in prayer. He stressed that we not lose faith in G-ds mercy, and that our prayers will ultimately bring the final redemption that we so long for. Once again it was Benny whose words were of comfort to the crowd. As the procession made it's way from Jerusalem to Shilo, the convoy of cars went on for miles. As we passed the settlement of Ofra, which has lost a number of people to terrorist attacks over the past few months, we were witnesses to a heartwarming sight. Hundreds of residents, men, women, and children, stood by the roadside at 10 o'clock at night as we drove by. They stood in silence, some holding Israeli flags, others with signs that read "we are all Yehuda Chaim Shoham". This scene repeated itself at every settlement that we passed on the way. The pain and love in their eyes was just another sign of the unity Yehuda had brought to our people. The burial of a 5 month old baby to such young parents is heart wrenching, even more so when he's your cousin. As the tiny body was placed in the grave and Benny recited the Kaddish, we all said our teary good-byes. We prayed that this would be the last death in our fight for the land of Israel. From Shilo we traveled to Neve Aliza, where Bat-Sheva and Benny would be sitting shiva. The house that Bat-Sheva had grown up in was now her house of mourning. As I recited the passuk upon leaving the home, I was in awe. I had come to comfort them, they had just lost there one and only son, but the opposite was true. They continued to show tremendous courage and faith in Hashem. They strengthened my love for our land and our people, never doubting for a second that we are right and that G-d will prevail. The courageous message that I got from Benny and Bat-Sheva was loud and clear, we mustn't let this death be for not. 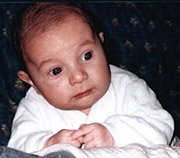 Yehuda was just a baby, without sin or enemy, yet he was killed for one reason only, he was a Jew on his way home in Eretz Yisrael. Each and every one of us must act to assure that we are doing our utmost for the people of Israel and the land of Israel. We must return to Israel from the Four Corners of the earth, and we must settle the land. We must return to G-d, for it is only Hashem that can help us through this terrible hour. Help us help ourselves, as we hope to make this the last tragedy to befall Am Yisrael. Many thanks to the many people who have written things about Yehuda which have been incorporated into this page.